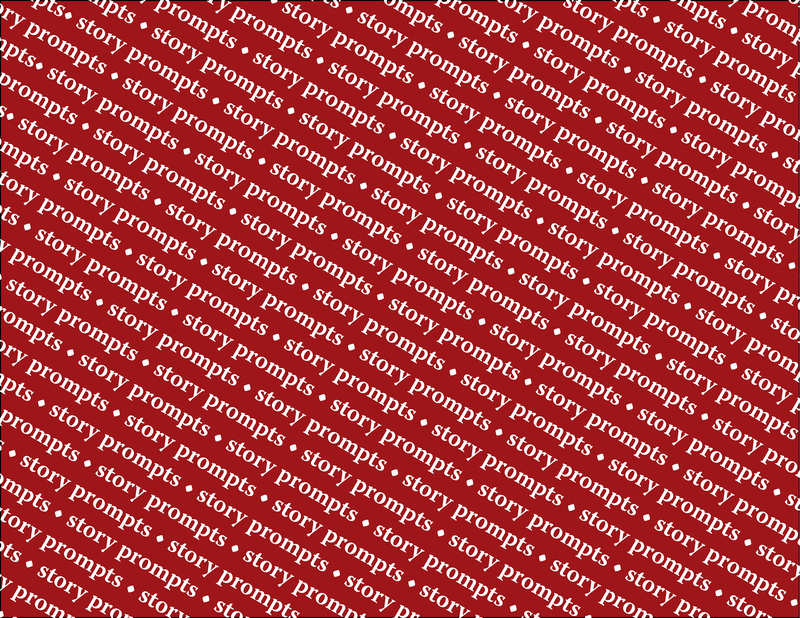 This is the fifth in the series of story prompt jar gifts with questions geared for anyone. 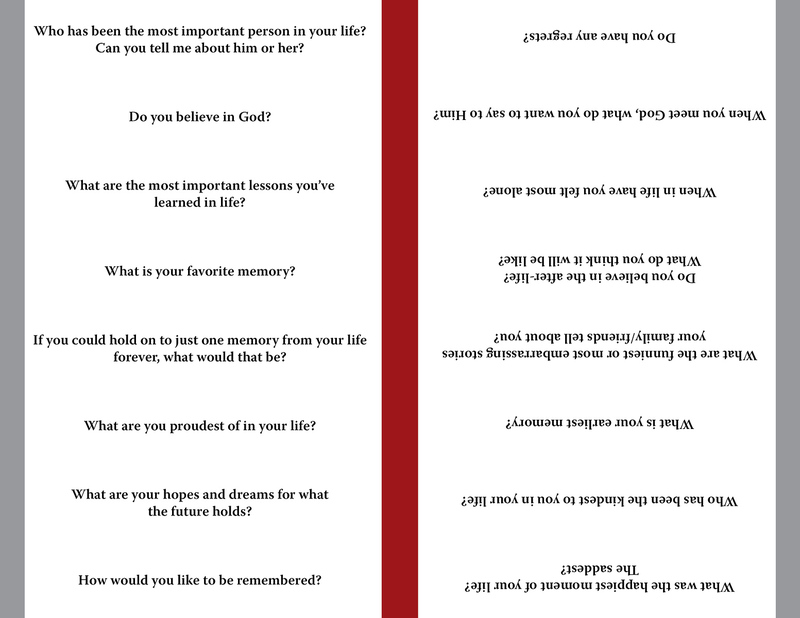 The idea is a set of questions in a jar that you can pull out to help anyone to remember and record some of the events from their lives. I printed it on chipboard but they could be printed on cardstock. 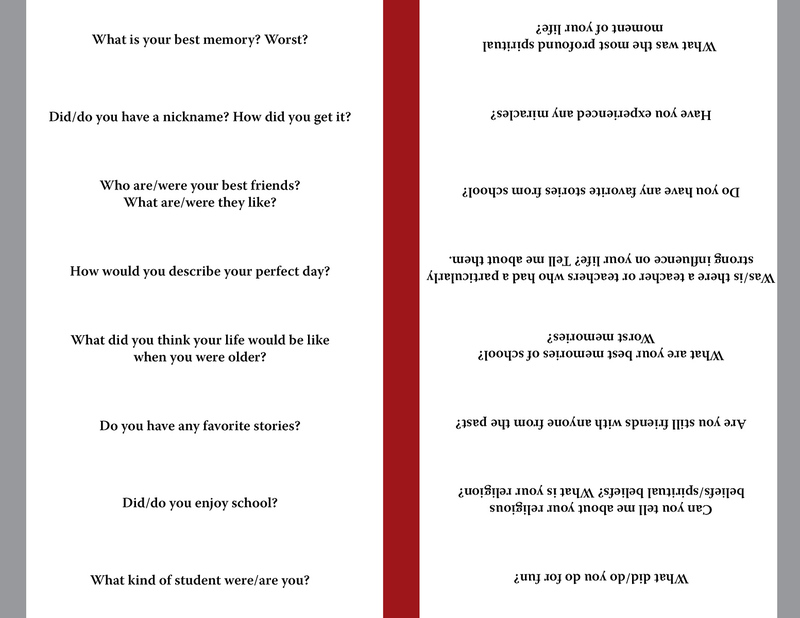 There is a different color on each end of the question so that once you have answered it you can turn it over in the jar and keep track of which questions you haven’t answered yet. The questions are intended you spark your memory and lead you to other thoughts and memories. Let your them flow and see where they take you. 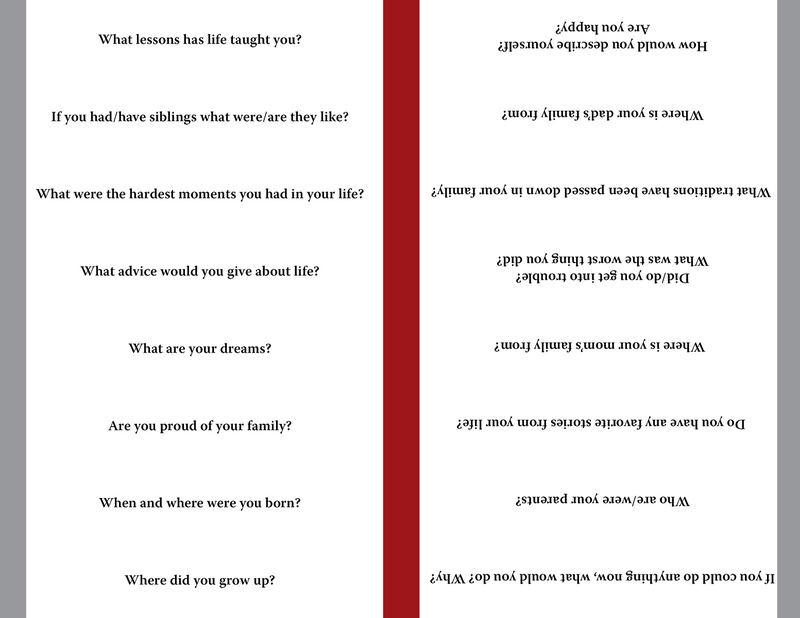 The next four sheets are the questions. After printing these pages need to be cut apart by cutting the sheet in half (the long way) at 5.5″ and then every 1 1/16″ to finish cutting the questions apart. 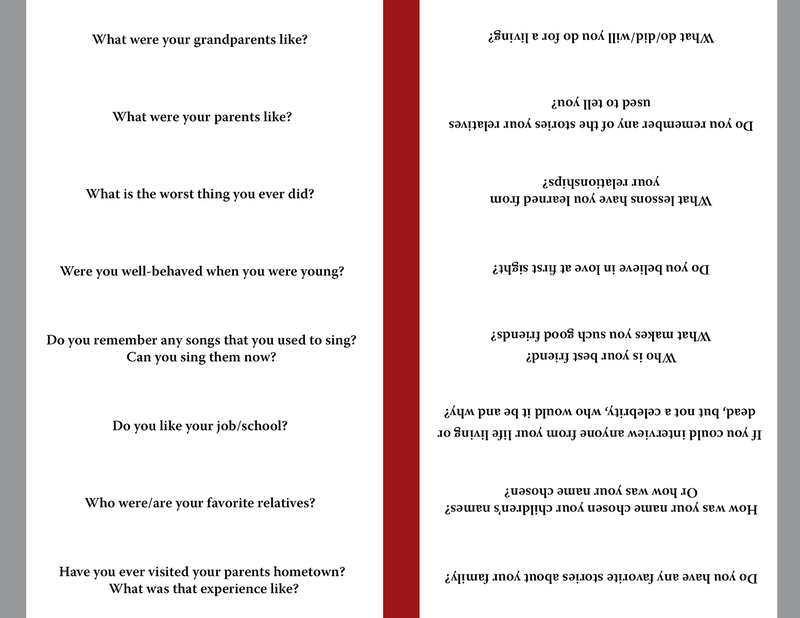 I also like to use a corner rounder on each question but that is optional. But it looks nice and will help the questions not get so dog-eared with use. The last page has an insert for the canning jar lid (wide mouth quart or pint and a half work great) and a set of tags to tie on to the jar with simple instructions. 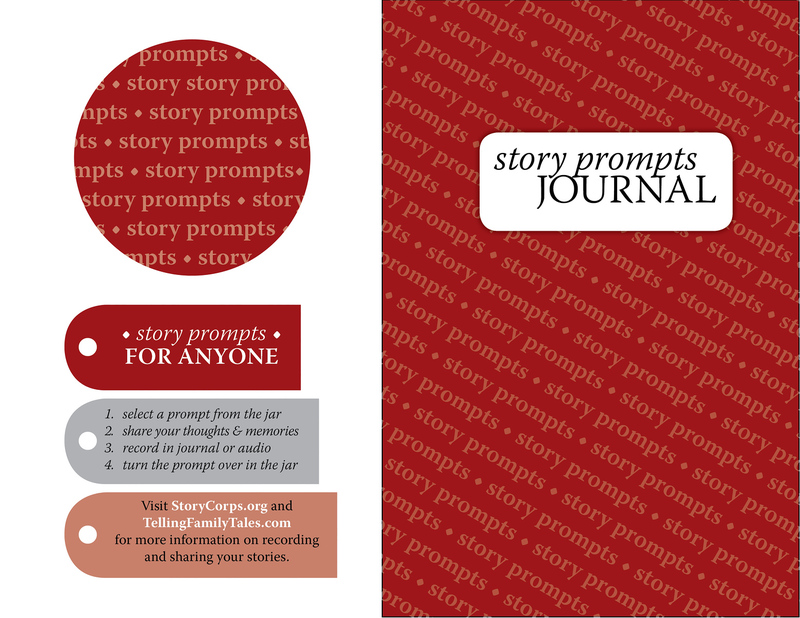 There is a journal cover so that you can also give them a place to record the memories for sharing and future reference. Cut another piece of chipboard or heavy cardstock for the back along with some blank or lined paper for the inside. Then bind them together by your chosen method. I’m lucky enough to have a wire binding machine but you can get the journal bound at your local copy center. This sheet isn’t strictly necessary but it helps pull the gift together into a nice package. 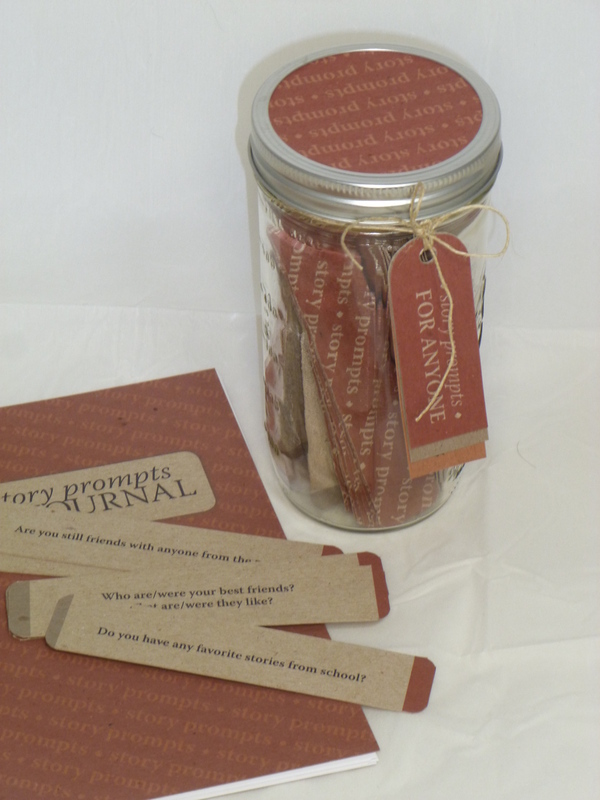 I am putting the jar and journal in a gift bag along with some treats to munch on while answering the questions to help get them started on recording their memories. Feel free to use these files for personal use and gifts. You can download pdfs here. Questions come from those at StoryCorps.org. This entry was posted in DOABLE approach, Gift Ideas, My Projects, Story Prompts, Storytelling and tagged Christmas Gift Ideas, Family, family history, family stories, gift ideas, grandparents, Mason jar, personal gift ideas, sharing family stories, Story Prompt Questions, story prompts. Bookmark the permalink. What a great idea. I’m going to post the link on my FB page. Thanks for the complement. I hope everyone on Facebook enjoys it too. My name is Raelyn Webster and I'm passionate about using design principles to create projects that tell a story. I've been a scrapbooker but found it too decorative and was drawn to digital mediums. I'm now on a quest to find more ways to share those stories that connect families together be it through books or videos or something new. Along with being a designer I'm a puppy raiser for Guide Dogs for the Blind. So I'll be posting about my puppy adventures regularly. I also find myself involved in other creative projects from time to time that might pop up in my posts.